Black and Hispanic students are closing the achievement gap in Texas, especially when it comes to completing high school. The Texas Education Agency said Tuesday that a record 88 percent of high school students graduated on time last year, marking the sixth straight year of gains. Education Commissioner Michael Williams said the number of Class of 2013 students who finished high school in four years was the highest since records have been kept in their current form, at least through the 1990s, and had increased from 87.7 percent from the previous year. The latest data includes all-time highs for two minority groups: an 85.1 percent graduation rate for Hispanic students and 84.1 percent for blacks. The same report from the Texas Education Agency shows 1.6 percent of the nearly 2.2 million students in grades seven through 12 during the 2012-2013 school year dropped out. That's a slight improvement from the previous year. "The Class of 2013 continues an ongoing trend of success in the classroom which has translated into more high school diplomas," Williams said in a statement. "With additional flexibility now provided to school districts, we should expect graduation numbers to remain strong with all students better prepared for life after high school in college, the workplace or military." That's a reference to a curriculum and graduation standards overhaul approved by the Legislature in 2013 that cut the number of standardized tests needed to graduate from 15 to five while also reducing the required number of advanced math and science courses. The new rules, which are still being fully implemented, are meant to give students more flexibility and allow them to focus on career and vocational training rather than just college prep courses. Williams added that a "gap still exists" between black and Hispanic students and their white counterparts but that things were improving. In his own statement, Gov. Rick Perry said: "We've set the bar high for Texas students to ensure every graduate is ready for college or career, and they have consistently demonstrated that they are up to the challenge." Previous federal graduation rate figures, though, have reported different, sometimes lower, rates than the state tallies. Federal figures for 2013 are not yet available. A federal study in November 2012 that found Texas' four-year graduation rate was 86 percent for the Class of 2011, high enough to tie it with five others for the nation's third-best rate. For that year, the state reported a four-year graduation rate of 85.9. A different set of federal figures released in January 2013 found a four-year state graduation rate for 2009-2010 of 78.9 percent. That study, from the National Center for Education Statistics, estimated high school attrition rates among ninth-graders over four years. According to state officials, the graduation rate for the Class of 2010 was 84.3 percent. 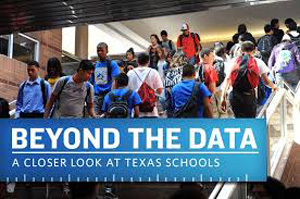 Texas says its figures are more accurate since it tracks actual cases that can be adjusted for things like student moving away before finishing high school. "It's been encouraging in recent years that no matter what definition has been used, the trend rates are going up," said Debbie Ratcliffe, a Texas Education Agency spokeswoman. "They all show higher graduation rates and lower drop-out rates."